The Oman Construction Company LLC (TOCO) is one of the oldest and foremost oil and gas services company operating in the Sultanate of Oman since 1965. During the five decades of its service to the Omani oil and gas sector, TOCO has placed itself as a symbol of ‘Operational Excellence’ in its chosen areas of business. TOCO is part of Oman’s oil and gas legacy with several ‘Firsts’ to its credit. The list includes construction of the first pipeline (Fahud to Mina Al Fahal in 1966), flow line, production station, tank farm, overhead power line. In 1967, TOCO moved the first rig at Fahud. 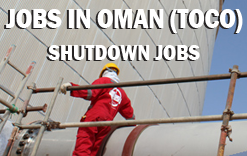 TOCO has been associated with majority of the oil & gas operators in Oman since the very beginning of their operations and the relationship still continues. All candidates should have at least 5 years’ experience in Oil & Gas industry, preferably with GCC experience in Shutdown / Maintenance Projects. Attractive Salary with Free Food & Accommodation will be provided.